GlySign is a European Industrial Doctorate Network employing six PhD students focusing on the development and validation of glycomic clinical markers and assays for PT. To date, it has been challenging to reliably analyse protein glycosylation. By combining the expertise of among world-class research institutions acting at the forefront of glycomics technology development, clinical assays that are simple, fast and reliable enough to be used in routine clinical analysis will be established. To this end, already known sugar (or glycan) signatures of four different diseases - diabetes, prostate cancer, neonatal alloimmune thrombocytopenia, and rheumatoid arthritis – will be used. Pharmacogenomics (PGx) is the study of genetic variability affecting an individual’s response to a drug. Clinical application of pharmacogenomics knowledge will result in less ‘trial and error’ prescribing and more efficacious, safer and cost-effective drug therapy. The Ubiquitous Pharmacogenomics (U-PGx) consortium will investigate if the emerging approach of pre-emptive genotyping of an entire panel of important PGx markers is cost-effective and results in a better outcome for patients . 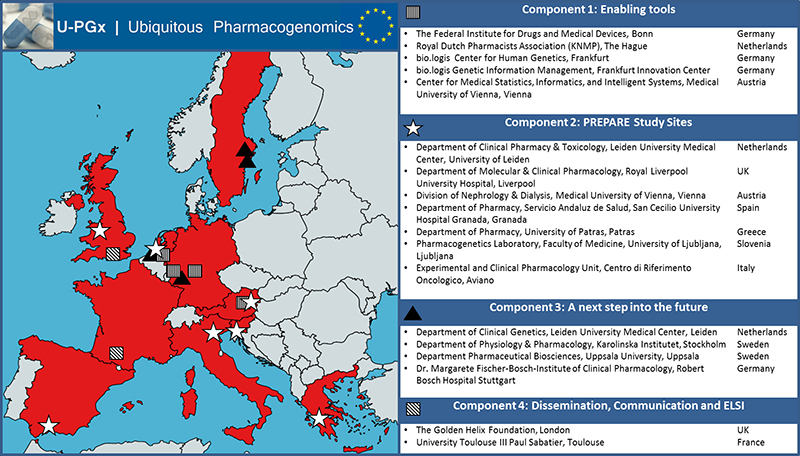 This new model of personalised medicine through pre-emptive PGx-testing will be conducted at a large scale in seven existing European health care environments (The Netherlands, Spain, UK, Italy, Austria, Greece, Slovenia). In the DIRECT consortium we aim to identify biomarkers and define subtypes with rapid diabetes development and progression as well as altered response to diabetes treatment. Furthermore, we aim to identify, develop and use surrogate response biomarkers that reflect the underlying disease progression in clinical trials. •The extent to which certain therapeutic interventions (either drug or surgical) results in improvement in glycaemia. The Rhapsody consortium aims to define a molecular taxonomy of type 2 diabetes mellitus (T2D) that will support patient segmentation, inform clinical trial design, and the establishment of regulatory paths for the adoption of novel strategies for diabetes prevention and treatment. RHAPSODY is based on the availability of large population prospective cohorts, with unique collection of genetic, biochemical and clinical data. RHAPSODY will also beneficiate of extensive and unique resources developed in previous IMI projects. Combining new and existing data with the expertise of its partners, RHAPSODY will develop novel biomarkers to refine diagnosis leading to better patient stratification, promote prevention, and support innovative drug discovery for personalized management of diabetes. Sarcomas are rare cancers that are difficult to diagnose and treat, as >50 different subtypes are recognized. Molecularly, three main genomic mechanisms are distinguished. Therefore, three functional cell-of-origin based models will be generated. The identified crucial pathways will be manipulated in patient derived tumor tissue, to explore possibilities for therapy. In the project focus will be on identification of critical gene-networks driving interactions between cartilage and bone, which characterize OA-subtypes. For classification, biomarkers will be identified in the joint tissues and plasma from RAAK patients to allow stratification by virtue of circulating microRNAs. To capture biological complexity and decipher interaction of the bone/cartilage interphase, a mechanically perturbed human in-vitro micro-mass system will be developed, with engineered osteochondral tissue prone to enter an OA-subtype specific disease state. To accurately introduce aberrant function of critical genes, CRISPR/Cas9 technology will be applied. The OA-subtype specific in-vitro micro-mass models of joint tissues will then be exploited to develop OA-subtype evidence based treatment options that may provide the basis for precision medicine. 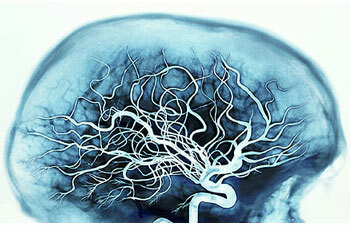 NWO VIDI project: The NOTCH3 disease spectrum: is CADASIL the tip of the iceberg? Recently, the CADASIL research group has discovered that NOTCH3 mutations associated with the hereditary small vessel disease CADASIL, are 100 times more frequent in the population than expected. We propose that the ‘NOTCH3 mutation position effect’, plays an important role in an expanding NOTCH3 disease spectrum. The aim of the study is to determine whether a subclass of cysteine altering NOTCH3 mutations underlie small vessel disease in 60+ year old individuals, in whom CADASIL would normally never be considered, and to further study the impact of the NOTCH3 mutation position effect on the NOTCH3 disease spectrum. Mortality by cancer remains one of the top causes of death in the Netherlands and the developed world. Deep sequencing has identified the presence of somatic mutations in GPCRs in patient derived cancer isolates. The proven druggability of GPCRs (30% of drugs act via a GPCR) makes them an excellent target to be exploited in this context. However, further research is required to distinguish cancer linked mutations from mutations that are part of the natural variance (and no driver mutations in cancer). Linking the optimal drug to mutational patterns present in GPCRs is the goal of this project. RD-Connect is a global infrastructure linking up data from rare disease research projects in a central resource for researchers across the world. It is developing an integrated platform in which omics data will be combined with clinical phenotype information and biomaterial availability, accessible online and queryable with a suite of analysis tools. By developing robust mechanisms and standards for linking and exploiting existing data and research results as well as data generated in new research projects, RD-Connect will support rare disease research worldwide, in particular research funded under the International Rare Diseases Research Consortium (IRDiRC).